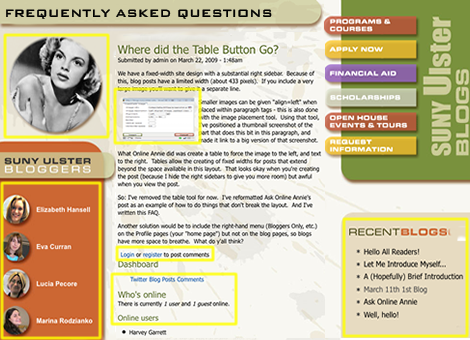 The yellow regions in this thumbnail indicate dynamic areas populated by Drupal content, including a title view of recent blogs, a title and thumbnail view of bloggers clickable to their profile pages, a title, date, content and comment view of frequently asked questions, and other social modules that tell who is online and links to their user pages. Because this is a Drupal site, there are different roles with different permissions: authenticated users, who can comment; bloggers, who can post blogs; webmasters, who moderate and answer FAQ submissions, and administrators, who authorize blogger accounts. Not shown here are "dashboard" sub-menus with content and actions appropriate to the role of which user is logged in. The graphic designer who developed the mock-up for this theme had never worked with Drupal before. Because Drupal made new things possible that were of value to the university, her designs were modified to accommodate that content, but beyond that, were realized as submitted. It took Game Face's Paul Solomon one week to complete the theming. Beyond a few minor user template modifications to match the graphic layout and views header PHP coding to associate user photos in blocks with authored content in the body, this multi-user blog site was created with off-the-shelf Drupal modules configured through the GUI.